NOCO’s location along the shore of Lake Erie in western New York did not help. Winter temperatures can reach −20°F, annual snowfall surpasses 90 inches, and winds average 12 miles per hour (mph), with peak winds well over 50 mph. 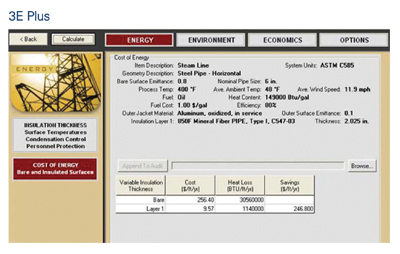 These severe factors made maintaining sufficiently high operating temperatures more difficult—and even more critical. The final problem was the terminal’s damaged insulation systems, especially on the product pipelines and heated-oil supply lines. All of these lines are located in ground-level horizontal pipe racks. 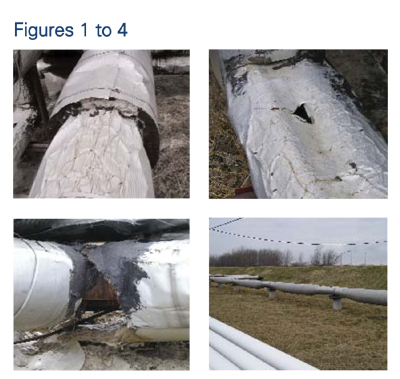 Over the years, between people stepping on the pipelines, maintenance activity, and the effect of the Buffalo-area weather, the insulation systems degraded. The systems’ poor condition contributed significantly to the terminal’s difficulty maintaining temperature in the asphalt and No. 6 fuel oil tanks and pipelines. The terminal staff believed upgrading the insulation systems would improve the overall reliability and efficiency of the systems, as well as save on energy costs. With the help of the New York State Energy Development and Research Authority (NYSERDA)—see “NYSERDA Offers Energy-Saving Expertise”—and the engineering firm Clough, Harbour, & Associates, they performed an evaluation of all of the insulation systems and determined the economic impact of upgrading all affected insulation systems, including the addition of 2 inches of insulation to the existing 2 inches. Because the terminal had a readily available, low-cost fuel source for the heated-oil heaters in used motor oil, the initial evaluation indicated an unusually long payback period for an insulation upgrade project like this—around 3 years. The new heated-oil heater was installed, but only some of the insulation was upgraded for several reasons, including schedule, equipment availability, and budget. Part of the problem was the fact that the insulation systems were much more damaged than originally assumed (see Figures 1 to 4) and had to be completely replaced. Because the addition of the new heated-oil heater and some rerouting of heated-oil lines were projected to actually increase fuel consumption and cost to the terminal, it became more complex to analyze the benefit of the insulation upgrade project to the overall facility. “Though it is difficult to quantify the fuel savings that resulted from this project, the original heating system was grossly undersized for our needs,” says Val Speek, terminals and facilities manager at NOCO Energy Corporation. “Burners were running at a 100-percent firing rate and were unable to meet the Btu demand for heating our asphalt. The addition of a new thermal fluid heater and the replacement of damaged insulation resulted in a surge of customer satisfaction. The heater played a major role in maintaining our marketing tanks at an acceptable temperature, while the replacement of damaged line insulation increased efficiency and eliminated customer complaints of cold asphalt. “This is the first year I can remember having no problems loading asphalt in the cooler weather,” Speek adds. Even better than the projected cost savings and emission reductions from energy efficiency is the fact that the properly insulated lines now pump product easier and faster, with far fewer plugging problems, allowing the terminal to operate more efficiently and profitably. The facility’s overall result is a win-win situation—a better-running terminal, more recycled motor oil to sell rather than burn in the heated-oil heaters, and less environmental impact due to fewer greenhouse gas emissions.